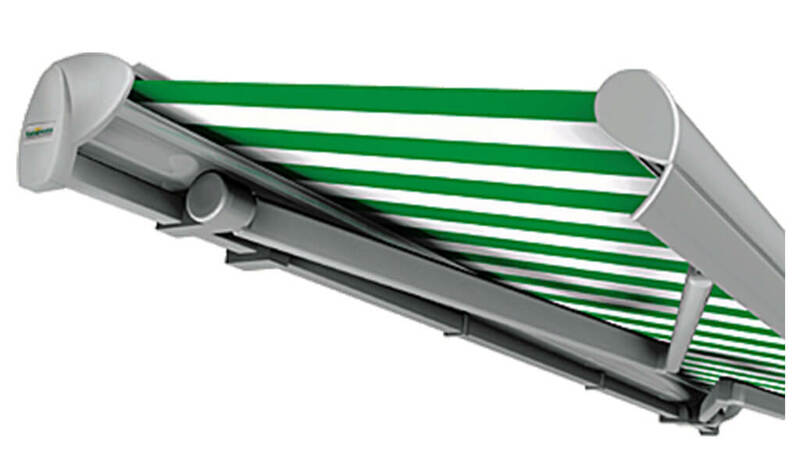 awning teams outstanding technical features and modern design with the appearance of a cassette awning. Front profile with very sturdy double hollow chamber. Operating components largely concealed by the generous front profile. Integral rain gutter, water drains off at the sides through the end caps. Front profile always sits close to the case. A 40 x 40 x 2 mm console tube, galvanized and powder-coated, is used. The fabric cover shell offers a harmonious solution for concealing the fabric roller. Front profile bracket Joins the arms securely to the front profile. Notching permits adjustment of the angle. Reliable and secure, the arm bracket is made from high-strength aluminium alloy. Its round design matches the contour of the fabric cover shell.